The global church is one in which Christians are both connected to and conscious of other faiths and denominations, says a Georgetown scholar of religion. Although Christianity has been spreading across the globe for centuries, today we are aware of this globalization and are challenged with the task of living in a pluralistic world, said José Casanova, professor of sociology at Georgetown University. Casanova is a professor of sociology at Georgetown University and heads the Program on Globalization, Religion and the Secular at the Berkley Center for Religion, Peace & World Affairs. 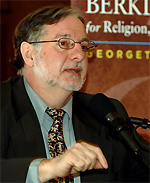 He is an expert in religion and globalization, migration and religious pluralism, transnational religions, and sociological theory, and his book “Public Religions in the Modern World” is considered a classic in the field. In 2012, Casanova received the Theology Prize from the Salzburger Hochschulwochen, for lifelong achievement in theology. Casanova spoke to Faith & Leadership while at Duke University to give a lecture as part of the Religions and Public Life (link is external) initiative. The following is an edited transcript. Q: How is “globalization” different from the historical spread of Christianity across the globe? You could argue that the Christian church has been a carrier of globalization for 20 centuries. You could say that religions — not all religions, but those religions that have come out of what is called the Axial Age: Buddhism, Islam, Christianity — have been globalizers. We have to differentiate what we will call the “age of globalization,” the age in which we all, whether we want to or not, become consciously aware of globalization, both in terms of global connectivity — everything that happens affects everybody else in the globe — and global consciousness. This combination of connectivity and consciousness. The condition that we are really within one single globe, and within this globe there are many, many religions claiming to be universal and global. And so it is the task to organize a world of pluralistic universalism, which is the interesting new phenomenon that we find today. This is the awareness that we are all in one single, global humanity living in the same time and space. This is what I think is radically new. Q: So both the interconnectedness and the consciousness of our interconnectedness. Especially the awareness that this is a condition of plurality. Before, as long as you tried to Christianize the world, to make the world Christian, and you are the true faith, then you are under one particular idea of globalization, one in which your own form of being global is hegemonic and universal. Q: You have a project on the Jesuits’ globalization (link is external). Talk a little bit about that. Well, the project came about because the Jesuits were the first globalizers in the sense of global connectivity. They played a crucial role in connecting North and South, East and West. They were brokers, cultural brokers. They brought the cultures of the East to Europe. They brought the cultures of Europe to the East. The Jesuits at first go with the ships — colonial colonizers, Portuguese and Spanish. But soon they break away from them — precisely, to penetrate China and India and Japan and Paraguay, and they go native. They go native in a way in which they become what we would [call] today “glocalizers” — they are global and local at the same time. They became Brahmans in India, mandarins in China, Indians in Paraguay, slave owners in Maryland. So it becomes global and universal by becoming local everywhere. They had an original model of globalization that was more attuned to the kinds of issues that we are also confronting today. Then eventually, they lost ground. They were expelled from every Catholic country by the Catholic kings. Then the Catholic kings forced the pope to dissolve the order, because they were too global, too transnational. For me, the interesting thing is that in the last 50, 60 years, we’re entering a new phase of globalization which doesn’t have a Western center but is much more open to what we call multiple modalities. And the Jesuits have become again interesting global players in global education. They were pioneers of education in the 16th, 17th centuries, but they were dissolved. They lost all their colleges everywhere, with the exception of America. They were expelled from every country, and they took refuge in Protestant America and in Orthodox Russia. So you have Georgetown, the first Jesuit university, which was established precisely at the point when the Jesuits do not exist anywhere else. But in the last 50 years, they have reopened universities everywhere. For instance, now India is the largest Jesuit province. So the Jesuits today are not anymore a Western order, but they are predominant more in Africa, Asia, Latin America, which of course [also] happened to the global church. They present an alternative model of globalization to what would be called capitalist globalization. Q: Have you discovered any lessons from the Jesuit past for the church today? Perhaps not lessons, but at least it opens up the idea that there are simply different ways of globalizing. And so the idea [of the Jesuits and Globalization Project] is to look for which aspects of their historical contributions are still of interest for us today as we are facing these global questions, and then use this tradition to help the global church reflect upon the challenges they have today. I think that partly the Jesuits themselves do not reflect enough upon their own tradition. [The project] also is a way of offering the Jesuits a forum for self-reflection around global challenges. Q: You’re talking about a church institution that has persisted despite being disbanded. This makes me wonder whether American Protestantism is premature in predicting its own demise. The argument is that the 20th century was both the American century and the American Protestant century. And to a certain extent, it was. But we know that global Christianity is really, really flourishing everywhere. [This is] very much out of the evangelical thrust of American Protestantism. And today, you have global centers of Pentecostal Christianity, which originally came out of the social street experience, in Brazil and Korea and Nigeria and South Africa and so on. So on the one hand, you have a transnationalization of what could be called forms of American Christianity that now are not American anymore but have become global. So you could also say that American Christianity is very much linked to what we could call the self-evident truths of life, liberty, the pursuit of happiness — that they have become or are becoming self-evident truths. The interesting question about American Christianity is the extent to which it is so linked to something which goes beyond Christianity. At the time where perhaps we may be concerned and even worried about the survival or the decline of the Protestant churches in America, we should be aware that whatever American Christianity was is becoming globalized today very, very rapidly. So it’s a very interesting tradition today, in which human rights, the sacred human rights which emerged most clearly in the United States in the self-evident truths of the Declaration, have become globalized. But they become globalized not necessarily through Christianization but through precisely the kind of dynamic relation that happens between different cultures and world religions. They compete. You could say that today all the world religions compete with one another to claim, “We are the truly human religion, the one that does more for humanity.” There is a very interesting kind of competitive denominationalism, in which each religion claims to be unique and different and particular, and yet, at the same time, universal for all of humanity. Q: What is the effect of increasing ethno-religious and cultural diversity in the American church? Well, it goes both ways. American evangelicals go and missionize the rest of the world, but then Christian immigrants come here and bring a different form of Christianity. It is most obvious in the case of Catholicism, because of the impact of North American Catholicism upon Latin American Catholicism, but then so many Latino immigrants would come here and renew the Catholic Church. But the same goes for the Latino Protestants and Protestants from Asia, Korea and so on. So American Christianity went global, and then, in return, immigrants bring new forms of global Christianity to America. And I would argue this is the greatest strength of the United States. We could say America is the first truly global society by becoming the first society made up of all the religions of the world. This is, I think, a very interesting experiment. At the very moment when people talk of the clash of civilizations, in America the experiment is taking place where all the religions of the world are becoming part of American society. Then all those immigrant religions have a crucial transforming effect in their home countries, the same way that American Catholicism transformed world Catholicism, American Judaism transformed world Judaism. And today, American Muslims have an impact on world Islam. Q: You have said that you reject the idea that modernization inevitably leads to secularization. Why? In Europe, it is taken for granted, because the experience is overwhelming, that as European society becomes more modern, they become less religious. And so the explanation was they are less religious because they are more modern. But of course America was always more modern but continued being religious. And then we see how the rest of the world modernizes and they become, not less, but more religious. At the time of [American] independence, at most 20 percent of the population belonged to churches. The Christianization of the American population happened later, through the Great Awakenings. So in this respect, the democratization of America and democratization of Christianity went hand in hand. So in America, to become modern, to become religious, to become democrats are one and the same thing. As long as it was the United States, it was called American exceptionalism — America as the exception to the European rule. But now Korea became Christian as they became modern, and China is becoming now as it’s modernizing. Muslim countries are becoming more religious as they become more modern. And so it looks more and more as if it is Europe that is the exception. But then, if modernization is not the explanation, what is the explanation? So the question I’ve dedicated much of my life to in the last years is to try to offer a better explanation of why European societies have become more secular. It’s not because they are more modern but because European societies went through a process of forced confessionalization, in which every state became a confessionalist state and cuius regio, eius religio, the religion of the king determined the religion of the subjects. And so they became homogenous Protestant in the North, homogenous Catholic in the South, and then three biconfessional societies in between: Holland, Germany and Switzerland. These boundaries remained until the 20th century. There was no change. We know that in America, people change their denominations. According to the last Pew survey on religion, almost one-third of American adults claim to have changed their religion since childhood. This is unthinkable in Europe. Nobody changes their religion. The only movement is from the church to secularity. In Europe, unchurching means deconfessionalization, because people had a confession forced upon them. Here, denominational identities are voluntary; they are not imposed by the state, but they are part of a project of mutual recognition of groups in society. So the history of confessionalization and deconfessionalization in Europe is very different from the history of denominational affiliation in the United States.